I am 35 years old, live in a quiet village in Norfolk, England with my partner Linda. We have 2 children (including our latest arrival Amy born just 3 weeks ago) and am currently working for the Prince's Trust as a Team Leader. I have been working with young people (aged 16-25) for 14 years. I was born in 1966, so missed Mercury, Gemini and Apollo. My first space recollection is ASTP in 1975. I remember watching the live coverage on TV and being fascinated when told that the two spacecraft were in orbit around the earth and were travelling about 5 miles a second! I think that's where the seeds were sown. STS-1 in 1981 rekindled that interest. I was hooked. 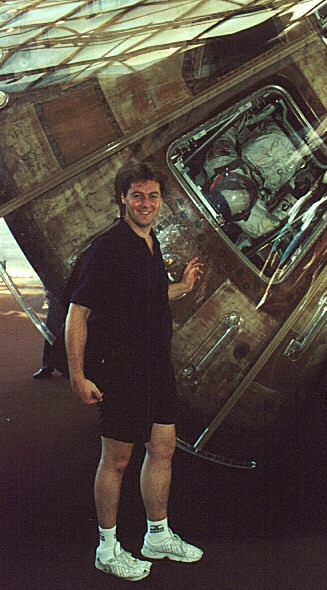 Now, 21 years after the event, I have a wide and varied collection of space memorabilia, including astronaut autographs, tape recordings, 100's of hours of video and numerous books. Future projects include trying to secure the complete set of air-to-ground tapes from Apollo and perhaps writing a book, perhaps on the subject of EVAs. Thats about it, the pic was taken at the Smithsonian 3 years ago....me and Apollo 11!! !